The continuing defamation of Namib Desert Diamonds – NAMDIA – through malicious and unfounded reports riddled with innuendo and adjectives designed to sway opinion by particularly “The Namibian” newspaper cannot be allowed to continue unchallenged. Whilst we fully recognize, appreciate and respect the right of the editor to express opinion in the editorial section, “The Namibian” newspaper’s reports have, since 2016, openly displayed hostility underscored by unfounded allegations, purportedly by “insider sources” who continue to remain anonymous to this date. We have decided to issue our response to this through a paid-for advertorial in all major newspapers of the country as we are confident that our response will not find its way on the pages of “The Namibian” as has been proven by the newspaper’s deliberate omission of Namdia’s responses to its questions and our stance on certain issues, including the alleged underselling of diamonds; our mandate and many other issues to an extend we have had to resort to paid-for-advertorials to respond to its allegations in its very own newspaper. This is an open letter therefore to the Editor of “The Namibian” newspaper. Your continued use of adjectives to “telling it the way you want people to see it” rather than “telling it like it is” as your slogan says, is a clear indication that your reporters and indeed editors are veering away from the journalistic ethics which should hold you accountable. Be that as it may, our respect for the role of the media as the fourth estate of the democratic process would not allow us to engage in a war of words with your institution but the continued agenda-setting reporting which we can only describe as an obsessive witch- hunt bordering on vindictive journalism, leaves us with no choice but to, once again, respond to your allegations as per your editorial of Friday, 9 November 2018. – “Namdia is run like a professional outfit…”. Yes, we are a professional outfit which has, in a relatively short period of its existence, been able to establish and position itself as a professional, reputable international diamond marketing and sales company, generating a profit for its shareholder (the government and people of this Republic). We are fully aware that for the detractors of success, this is a painful sight to behold but we remain unapologetic for our success. two years of our existence made our Annual Reports public for you to share with your readers. However, you have chosen to be selective in your reports and continued to use misleading adjectives to try to sway public opinion away from the success story and towards setting the agenda of the interests of players you have now shown to represent. – “then the sweetener – a N$50 million dividend to a government which is often asked to bail parastatals.” – If our dividend, which we are confident will go some way towards the socio-economic development of this country, is a mere sweetener, then we hope for many more such sweeteners. After all, we would have thought you too would have been concerned with the development of our people and therefore see this “sweetener” as a worthy contribution. I guess our assertions were wrong. But, lets get back to the matters at hand. We find your comparing of Namdia to Bostwana’s Okavango Diamonds Company rather misleading and truth be told quite mischievous and out of context. Do you know that ODC’s monthly 15% entitlement is equal to Namdia’s annual allocation; that it has government guarantees which allow it to take risk and stockpile its product? This is a luxury we did not have. With no government guarantee, Namdia had to make do with what it earned from its sales to buy the following consignment of product from the NDTC and therefore could not take risks and stockpile product. With a committed buyer group, we were guaranteed monthly sales and therefore survival until the next round of buying from the NDTC. This, process, is clearly outlined in our latest Annual Report but we assume it did not fit your narrative and agenda and therefore not worthy of your analysis. As we progress in our growth process, we continually adapt to changing environments and apply best in class principles to ensure business success. One such area is Marketing and Sales and we take it that you are aware that Namdia recently called for potential clients to apply for buyer status and that we would in all likelihood select ten such clients to be our regular buyers for the next three years. As we progress, other options will be investigated and pursued. Or would you rather we follow other company’s business models blindly without thorough investigation? Your handlers and sponsors would surely gain through “the best policy may very well be to close down Namdia soonest…” as you assert. It is now clear that you are not interested in the truth but merely being your Master’s Voice. In the liberation era, such would be called a puppet. We of course, have too much respect for the role of the media to label any one worthy of his/her profession, working in such a noble space as the media; bringing news to the masses and “telling it like it is” fairly and objectively, a puppet. Moreover, we are disappointed that you express the interest of multinationals at the expense of a sovereign Namibian company and instead of celebrating its success, which is the success of the Namibian people, continue to vilify us through continuous regurgitation of falsehoods, inuendos and opinion-shaping so-called “investigative reporting”. We have at numerous occasions explained to your journalists (case in point being on 17 June 2018 but which the newspaper chose not to publish) that the prices of diamonds are not homogenous and that there is subjectivity in pricing. This whole scenario was explained in our response and further in our advertorial placed the same month in your publication following your journalists refusal to publish such. All these are industry leaders who have exemplary reputations in the industry”. And if you had bothered to ask us where we sell our diamonds to, instead of making your own assertions, the above would have been our response. There is nothing secretive about Namdia. It was established with the full knowledge and approval of Cabinet and its mere publication of audited Annual Reports is an indication that we have nothing to hide and therefore your implication that the payment of dividend to the shareholder puts into question the very existence of Namdia is mischievous at best and smacks of a colonial mentality at worst. For over two years, you have quoted “insider sources” as the most authoritative source on all things Namdia. Whilst being fully respectful of your obligation to protect sources, perhaps your journalistic ethics should have led you to us – affording us the right to reply before publication of regurgitated falsehoods. We are now confident that these ghost “insider sources’ are indeed your handlers and sponsors whose vested interest in the failure of Namdia is becoming increasingly clear. We may have to disappoint you and your sponsors in this regard. We remain unapologetic of our success which is as a result of innovation, dedication, commitment inspired by our desire to see the people of this country, finally benefiting from its natural resources. 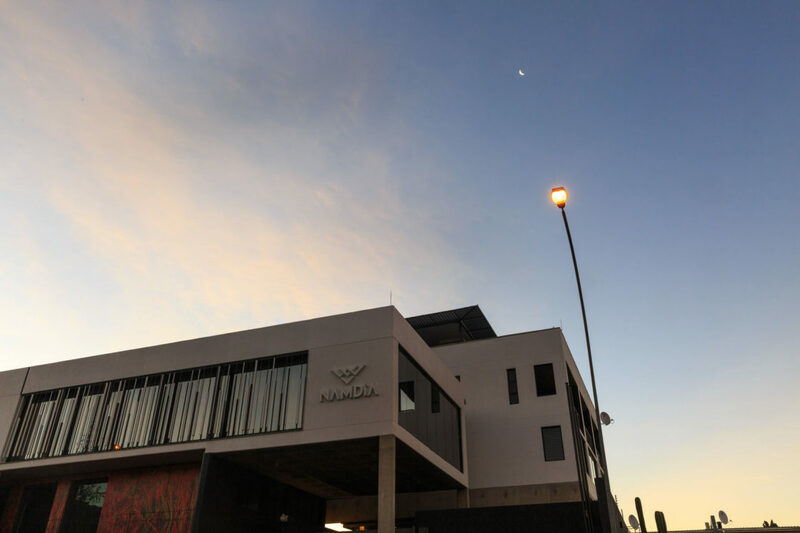 In two years time, we have declared dividends of N$50 million and will soon embark on a series of corporate Social Investment initiatives aimed at ensuring that communities are better off because Namdia is here. Can the same be said for your multi-national handlers and if true would you kindly highlight these to the nation, in the same manner as you have vilified Namdia for the past two years of its existence. In conclusion, all we have ever asked of your journalists and now from you, Mr Editor is fairness. If we have dropped the ball on certain operational issues, kindly highlight these but afford us the right to respond to allegations before continually regurgitating these falsehoods and innuendos aimed at tarnishing not only Namdia’s image but the image of all patriotic; progressive Namibians whose only desire is to see success of this nation’s endeavours towards economic independence.